There are so many amazing and powerful tools that allow us to run businesses like never before. In today's episode, Darryl talks to us about some of the powerful online tools he uses to run his online business and manage a team of remote staff efficiently and effectively. Darryl: Hi I'm Darryl King and I'm here with my co-host Ed Pelgen - a couple of old internet guys who have been running our online agencies for well over 20 years. We get together weekly to talk about all things online especially for small and medium business owners or executives who still refer to their bloody websites. Each week we aim to tackle a range of online issues and put them in plain language so anyone can understand how to make their website work better for their business. 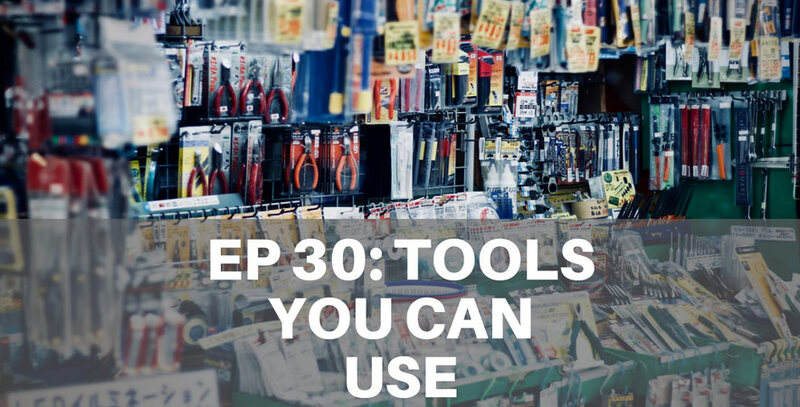 Episode 30 Tools You Can Use. How you doing Ed? Darryl: Is there tools or something? Edmund: so we like, we like to talk about a lot of those today and if we do they've got to be pretty awesome but well yeah that was my only point. Darryl: and/or then it sends you a different result so if you're a freebie person and wants free eBook - hey I've got a free eBook over here and then I don't send you anything for six months until I get the next free thing I can give you but people that are buying and doing - hey, well if you write a review; I'm gonna give you some access to something else. So and that can all be automated. In an e-commerce thing that abandoned cart stuff can be that you hope these tools up to your shopping cart software and it will ingest people into the system if they didn't complete to check out and then automatically go up send them this thing about this product that they had in the basket. Edmund: and what Darryl's talking about there is commonly termed marketing automation right? And the systems that do it actually for a lot of small businesses don't actually cost much more than the standard traditional campaign based email and I'm specifically thinking of tools like Active campaign, Drip right? drip is another great little affordable marketing automation platform and those two alone have awesome functionality and have these great little visual builders that says if someone signs up to this or downloads this lead magnet send them this welcome email, wait five days, send them this other email, wait another couple of days and then send them an offer or something like. That way you're not stuck having to send those out and keep track of it right? It happens automatically so that; it's a great big; great little tool right? Darryl: you know, like it's what's your goal? What are you trying to achieve? BUt there are so many tools like; we could talk for two or three hours. Edmund: yeah but you can't go wrong with say drip or active campaign they're good, affordable entry level platforms with a good user base and some couldn't acknowledge resources. You mentioned CRM’s which I think should lead us into having a quick conversation about that Darryl; I know you've had a bit of experience with good entry level CRM so what do you think? What are some great simple CRM’s for you know most small businesses to use? And what is the purpose of them anyway? Darryl: that; there's lots of levels of depth you know and they grow really big ; things like insightly I've used and kind of that as others what experience have you had ed? Darryl: because It was a good way to learn rather than committing because they're the big thing with the CRM is you have to commit time to make them useful otherwise they're a waste your time. Darryl: Particularly like agency and things; we; there's a whole heap of stuff you know from base camp and all these others anyway; I think biggest challenges we have is there are some tools like the Asanas and all that they try to do everything and then there are other tools that just do one part of it. Then I have sister-brother and modules that go with it. I eventually have always ended up where I try to pick the best of breed tool that I can for the thing that I wanted to do and then I merge them together and make them work so they're hooking it. We might talked about that there's a thing called Zapier and others if this if that in this these are web-based sort of like api connectors that allow you to use three or four different tools and join them together so that they fill the role of a bigger tool or help fit your business then you know the common one is Trello; I love Trello; I used Trello. I've been using Trello around the agency for way more than 10 years. A lot of people don't like it because it is very much individualized management; you don't have like a huge hierarchy where it forces everything apart certain parts. I like Trello for both project management and other things because it's very very agile, it's very very fluid; it's totally dynamics; everyone can see everything on the move all the time. Edmund: yep, so can you talk about what about; how do you; what tools do you use from a communications perspective like Trello is just the project management tool but what about communications do you recommend any tools to people should….? Darryl: there's some really really clever ways you can use it. you'd set up notifications you can mute a lot of it, you can integrated things; I know we have a channel where we integrate it with a thing called Bitbucket which is a git repository, through Atlassian and every time someone's committing it updates this channel with all the commits and stuffs so if your; the developers want to be checking it they can just see who's doing all the comments and things really; it's automatic and they don't have to log in a bit back to see all the stuff and you know they jus;t I'm working away, committing stuff and then over here; they call the team to stay on track; there's some really smart things like that….? Edmund: awesome; uh look, I know you also have a love - love relationship with a new tool called Milanotes. So why don't you tell us about what that's for. Darryl: it's just like fluid isn't it? Edmund: yeah, and and was it cost? Darryl: am I getting massive capacity; these; it's just; by fluid; I mean, I don't want that they don't drag it off the side of the screen and I want to put something else in here and reorganize the content and it's just like you had a massive desk and you're just lying out stuff like post-it notes and documents and photos or some yeah I just want to move it around I need to write a note here. That’s literally what it kind of feels like; it's not like a pin board, it's more just like a desktop that you just move stuff around. It’s very very cool. Edmund: now I'm going to ask you to talk about a couple of tools that you'll probably be very passionate about, a lot of people in the online space will be told you don't need a website, you can go and use a tool like Leadpages or Click funnels or Instapage or Unbounce. Can you explain to us what they are and where they fit into the big picture and you know when do they become a useful tool to help grow your business? Darryl: where is it stored? Is it stored across boundaries you know things like that you have to be aware of …? Edmund: I as someone who came from a you know; a very naive beginner and I you know I had no design skills; I the the idea of the tools appeals to me and I don't even there's some amazing functionality built into the platforms you know; they're really really good; what my only; I guess the only bug problem I have with it is that the way they're aggressively marketed sometimes is as a I'll make money online type tool and a lot of I see a lot of people in the forums and the groups who are oh, I bought Clickfunnels or bought this and but I'm not making any; I'm not getting any sales and it's like well they you know what I mean; they're looking at as a very short term way of making money as opposed to; it's a tool that helps solve a business need right? Darryl: what is it though? Edmund: if; for now and most business people probably won't need to go that far because they'll probably bring in a consultant or someone to look at that stuff for. Darryl: for anything you wanna do. Edmund: absolutely, what do you reckon Darryl? Is that it for the day?